Kath’s up in court already, she’s in the doc being accused of aiding and abetting, Danny watched on while Kath pleas not guilty. Meanwhile, Lisa’s back at Holby, she missed her chance to go to the courtcase because she’s so behind on her work, so much so, she sends Ben out ahead of her to a home birth. Meantime Kath’s court case has been adjourned til the 8th April, Danny thinks this can only be a good thing, whereas Kath isnt so optimistic, she thinks she should of just pleaded guilty so they could have gotten on with things. The mood seamed to have lifted though, that was until Danny mentioned Kath’s suspension, she began to panic, she explained that she had loads of paperwork that needed to be done and that she didnt want to leave it all for Chrissie to do when she got back of her honeymoon. At the home birth things arent going too well, Lisa still hasnt arrived and the mother in law of the patient is reluctant to even let Ben in the house let alone let him tend to her daughter in law, but with both mother and baby at risk, Ben has no choice but to phone an ambulance, when they arrive, the paremedics are men, again at much disgust to the mother in law. 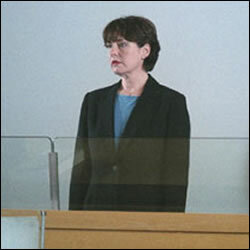 Whilst Mubbs and Lisa wait to get Andrea (the patient that held Lisa up in the first place so she couldnt get to her home birth) ready for a C – section, Mubbs suggests that Lisa should move on with her life, but she is quick to comment that she cant, not until Kath is locked up behind bars. Up on Darwin Ric and Diane’s patient, Rachel who has severe HIV problems has requested not to be rescusitated if she should arrest during or after theatre. Danny is fine with her decision as is Ric, but Diane isnt happy, she makes her feelings on assisted suicide clear, which is what she feels she would be doing if she wasnt to try everything to keep Rachel alive. Diane clicks what she has said as Danny walks off, Diane appoligises but Danny maintains that there is nothing to be sorry about because Kath didnt kill Terry, she’s innocent, un-be known to them all that Kath is in the office behind them sorting through paperwork. Ben’s worse nightmare, the ambulance is stuck in traffic and the baby needs to be delivered but if it is there is a strong possibility the baby will die because the cord will get squashed and stop the baby’s oxygen supply, but Ben has no choice, the baby isnt waiting for anybody, prolapse cord or not, the baby’s about to come. Luckily the birth was fine, the mother delivered the baby quickly as needed and with a little help from Ben the baby was soon crying and well. Back on materinty Andrea’s baby has been delivered through C- section, everything was going fine until the lights went out, the whole hospital was in darkness, and Mubbs still needed to close her up, luckily for everyone though the back-up generator kicked in, but not for long, before they knew, they were back in darkness and Mubbs was in trouble. Andrea was bleeding and Mubbs couldnt stop it, he tried everyhting, even a hysterectomy, and with the on-call consultant stuck in a broken down lift Ric was needed, leaving Diane in surgey with Rachel on her own. Back on Darwin, Kath’s still at the hospital, even though Ric and Danny told her she must go home. Danny informs Kath that if someone reported her for working that would be the end of her career, but Kath doesnt seem that concerned, she thinks her career is already over. The outlook for Andrea isnt looking too good, Ric has arrived but theres nothing he can do, she’s heading for multi organ failure, all they could do was patch her up and get her to Intensive care. Just then the ligths come back on to reveal Andrea’s husband was stood in theatre, he’d heard and seen all of the operation. Diane returned Rachel back to the ward safe and well, the operation was a sucess and she even patched things up with Diane by telling him that she hopes Kath returns to work soon. To celebrate Bens news of now being able to qualify as a midwife, Lisa, Ben and Mubbs head of to the pub with Jess and Steve, as Tony says he can’t make it because he has to work, needless to say, Ben isnt too happy, well that is until the paremedic turns up from earlier and offers a night of passion to Ben, something Ben accepts readily. Back on Darwin Rachel arrests, with the DNR still hanging over her Ric is uncertain whether to help her or not, her boyfriend insisits that they must but because Rachel never told them any different form her earlier request Ric was in a dillema, finaly he makes the right decision, they rescusitate Rachel and when she comes around she reveals that she’s glad they did, she didnt want to die. Back at the bar things are going well, Mubbs and Lisa are getting on, and so are Jess and Steve much to Ric’s annoyance, but Diane thinks its funny and just makes fun. The mood is soon changed though, Tony and Danny have both arrived. Tony wants to know where Ben is and Lisa is after explanations off of Danny as to why Kath pleaded not guilty at the trial. Luckily for Tony, he finds Ben in the toilets and takes him home for an early night. Just in time aswell, as World War three kicked off in the bar in the form of Lisa and Danny. Diane told Danny he should leave but Lisa made it clear there was no point because she was leaving, not before she gave him a piece of her mind though. Reminding him that people might not say it to his face but they all think the same as she does, that Kath killed Terry. Judge: Katherine Anne Fox, your charges follows that between 31st December 2002 and 1st January 2003 you did aid and abet the suicide of Terry Fox. How do you plead? Guilty or not guilty? Ric: Lisa, this isn’t helping anyone. Lisa: You go home and get your mum to change her plea. She’s as guilty as hell and she should admit it! Lisa: Forget it, I’m going. Mubbs: I’ll take you home. Lisa: Look around, Danny. You have to work with these people every day. They’ll be nice enough to your face, but behind your back they think the same as me. You’re lying scum, the pair of you! >>Guide by Steph & Karin.